My first encounter with pesto was not a success. It was 1993. I was a student with a recently acquired kitchen, a need to feed myself and an exceptionally useful Christmas present: Nigel Slater’s Real Fast Food. Emboldened by the fact that early experiments with then exotic ingredients like feta (baked with thyme), bulgar wheat (cooked with mushrooms) and haricot beans (on toast with tuna, tomato and chilli) were a complete success, I confidently picked up some basil pesto to try. After all, Nigel – at this stage my oracle – was a regular user of “pesto from a jar” even, as he once said, spread on his toast. What I hadn’t taken in, though, were quantities. Let me tell you, an entire jar of pesto mixed through spaghetti for one is not a mistake I would like anyone else to repeat. My inedible dinner ended up in the bin – something that just didn’t happen when you were a penniless student – and, Nigel be damned, I vowed to stick to more familiar ingredients, at least for the next week. Despite that first impression, pesto is no longer an unfamiliar stranger but a well-loved regular in my kitchen. I mash it into potatoes, use it to flavour homemade bread, mix it with mayo for chicken sandwiches (especially good with smoked chicken and gerkins) and sometimes, to Little Missy’s great delight, even use a couple of spoonfuls in a pasta supper – although not a whole jar. I’ve learned. On Tuesday morning I was standing in the middle of a basil field in Italy, breathing in the warm, spicy air and discovering where the basil in my jar actually comes from. Along with a group of Irish journalists and bloggers, I was there as a guest of Saclà who introduced pesto in jars to the UK and Ireland back in the early 1990s. It was a short, sun-soaked 48-hour slice of Italian life and an introduction to a family business. 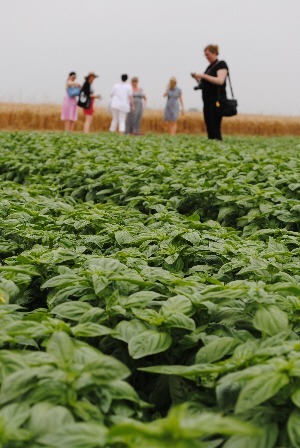 We visited one of the Saclà basil suppliers, a farm in Alessandria run by the three Amateis brothers. It’s a mixed farm of a sort that is becoming increasingly rare in Ireland: walking towards the basil, which is grown alongside maize and wheat, we passed sheds of relaxed-looking Charolais cattle (just had to take pictures to show my beef farmer father! ), a corner with melons and onions for family use and peach trees that cast shade on the path. The Amateis brothers also grow organic basil, rocket, spinach and parsley for Saclà and are the inventors of an ingenious machine that lets them delicately pick four crops a year from each basil plant. 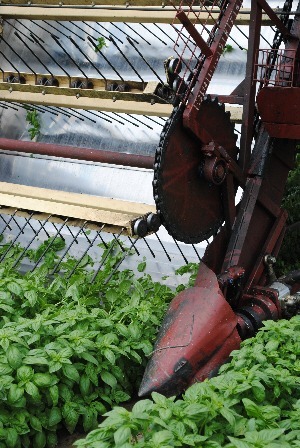 The fragrance as they cut the basil has to be inhaled to be believed. From their Piemonte base in Asti, Northern Italy, Saclà produce 40 million jars of pesto per year. They also make a variety of other sauces, antipasti and pastas, which we got to taste during an incredible lunch at Casa Saclà, cooked by mother-and-son team Sandra Stroco and Massimiliano Musso from the Michelin-starred Ristorante Ca’ Vittoria. It was family all the way, as we were joined for lunch by the charming Chiara Ercole, granddaughter of the founders and daughter of the current company president, Lorenzo Ercole. Casa Saclà was originally the home of husband and wife Secondo and Piera Ercole who set up the business in 1939 and, although the house has been extensively renovated, it still – in a very traditional Catholic manner – has relics of that family era, including some of the original wallpaper. The rest of the trip was a taste of Italian food culture and an introduction to the flavours of the region: over a wine tasting at agriturismo Villa Tiboldi we discovered Arneis, a grape variety indigenous to Piemonte that makes a lush, full-bodied wine; we sampled a delicate fresh egg pasta called tajarin, a local speciality, with a meaty sausage ragu at dinner; and spread rich toma tre latti (three milk cheese) on croissants at breakfast. 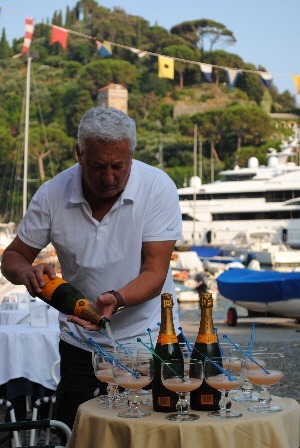 There was also time for a leisurely lunch under the trees at the Amateis brothers’ farm – melons dripping with juice, a huge hunk of crumbly parmesan, focaccia rich with olive oil, freshly cut basil leaves to scatter over each mouthful – pre-dinner bellinis and people watching in the square at Portofino (twin town to Kinsale, fact fans), and all of it done in very good company. Finally, fields walked and leaves sampled, it was time to say hello again to my former nemesis, now trusted friend. We had our first taste of pesto in a simple trofie pasta dish for dinner at the tiny restaurant O Magazin. Although late in the evening, the sun was still shining benevolently down on us, the sea sparkling just behind our harbour-side table and there was laughter and merriment all round. Things got a little blurry after that. 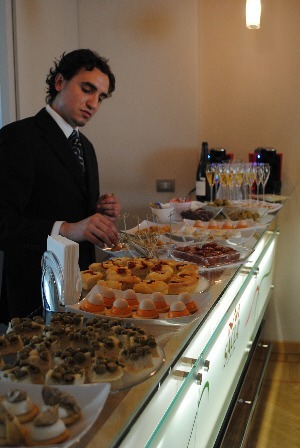 La dolce vita: good times, good friends – and good food. I was the guest of Saclà UK on a press/bloggers trip organised by Panache PR. All photos and opinions are my own. Many thanks to our exemplary hostess Clare, Sue for her unfailing good humour despite being struck down with a ‘lurgy and Lida for looking after us so well – and for sorting out the sunshine with a phone call! I love your story about your first experience with pesto – my first taste of it, as a teenager in suburban Illinois, was from a Knorr packet. Not surprisingly, I thought it tasted vile and didn’t try it again for years, and when I finally did have it again, it was a revelation compared to that dried mix. Looking back, why would anyone dehydrate pesto?! In a packet?! That just had to taste horrible. Look how far we’ve come from such inauspicious pesto beginnings! Thanks Gillian! How is life with chocolate treating you? Hope your own Little Button is keeping well. Awwww, such fabulousness!! I was living vicariously through everyone’s tweet pics, looks like you all had the most amazing time. I can imagine the sweet smell of those basil fields; you can typically find me in the corner of my kitchen, whispering sweet nothings to my handful of basil leaves as I inhale their fragrant aroma. Is that weird? You’ll have to come down and whisper to my sad looking basil plant, Clare. The last thing it heard was the Husband threatening to throw it out – I’m not sure if it’s going to recover from that! One of the reasons that I went on the trip, Veru, is that I knew that I would never get a chance to go there under my own steam – or to see the basil fields! I’ve had to throw out my own sorry excuse for a basil plant so homemade pesto is still a while off but I’m determined to make it this summer. Memo to self: Must not read your blog on an empty stomach……….an hour to go before lunch and I’m salivating reading this!!! You were probably around for some of those early pesto experiments! Although lasagne was the dish that we’d normally make when you visited us in college days.